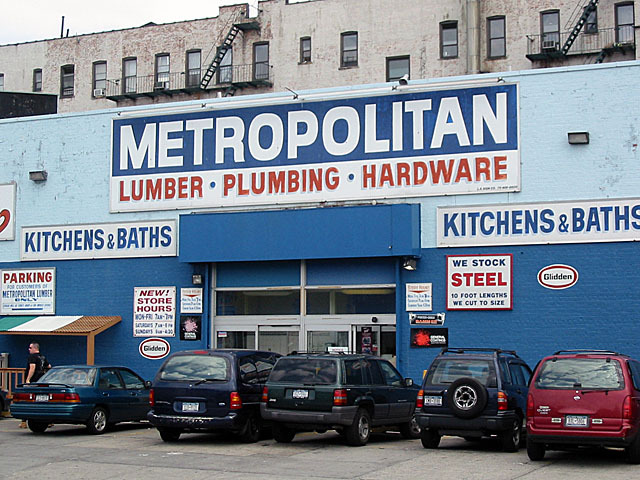 Metropolitan Lumber & Hardware is New York City's most complete lumber and hardware store. Open seven days a week, we have been serving contractors and home owners alike for more than 30 years. We have a vast and diversified catalog of tools and lumber at each of our five locations in the New York area. Add to this a fleet of more than 35 trucks, including boom trucks for quick service. All of our locations are full and complete hardware stores operating beside our lumber yards. Plus we offer the largest inventory of "Factory Serviced" power tools on the east coast. Our goal is to supply you with quality lumber and hardware at the best possible price. We have five convenient locations in Midtown, SoHo, Jamaica, Corona and Long Island City, New York. Our customer service professionals are experts in the business and are always happy and willing to help. So whether you're soundproofing your music studio or fixing a leak in the kitchen, stop by your neighborhood Met Lumber and we'll help you get the job done. We have the largest fleet of flatbed trucks in New York City (NYC). All of our construction materials will be delivered promptly and on time. No questions asked, you can get it at the Met. Our NYC locations include Midtown, SoHo, Jamaica, Corona and Long Island City, New York. For over 30 years Metropolitan Lumber has provided New York City with the tools to get the job done. If you need it, we have it. We are NYC's primary source for factory conditioned tools. We have a vast and diversified catalog of tools and lumber at each of our five locations in the New York area. Metro Lumber is proud to have the largest fleet of flatbed trucks in the NYC area, our vehicles are monitored and tied to Google Earth. Each of our trucks are tracked using GPS to ensure your material delivery is conducted quickly, safely and more importantly - on time. Here at Met Lumber, we love our city. We have evolved and responded to changing residential zoning laws over the last 20 years, positioning us as the primary provider of construction supplies, material and delivery. Over 65% of the tools have never been serviced. Most of the tools are returned from large hardware home center chain stores where the customers have used the tool for a weekend project and returned it shortly thereafter. These large chain stores return the tool to the manufacturer, on the manufacturer checks the tool it is no longer considered new, even if there is nothing wrong with it. The remaining 25%-30% of tools have had minor repairs and most often look brand new. Contact us today, 150 years of combined experience from an experienced staff of senior customer service representatives. If you have a problem, we have the solution.